One News Page > News Videos > Kendall Jenner Caught DROOLING Over LeBron James & Twitter Reacts! Kendall Jenner Caught DROOLING Over LeBron James & Twitter Reacts! Kendall Jenner has been making appearances as Sixers games throughout the season to support her boyfriend, Ben Simmons. Despite those cheating rumors we’ve been hearing about…BOTH OF Them seem to have a little problem with infidelity…the two seem to be going strong, and Kendall is always ready to cheer on her man. But she’s an LA girl, so she’s a lakers fan through and through…AND I have to imagine that cheering on the Sixers in this weekend’s game wasn’t exactly easy. 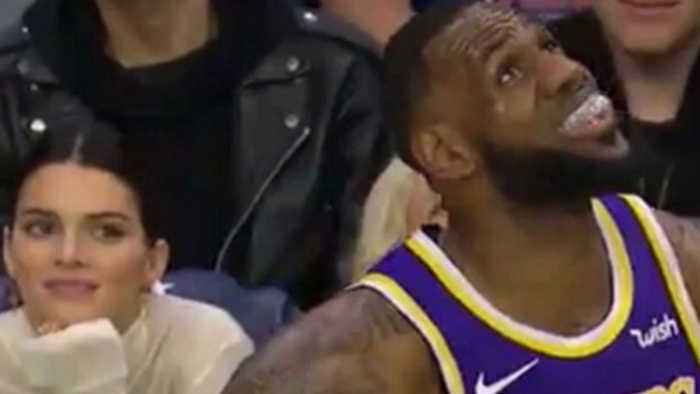 And the girl couldn’t help herself…she was caught ogling at Lebron James while he was on the court…and Twitter erupted.